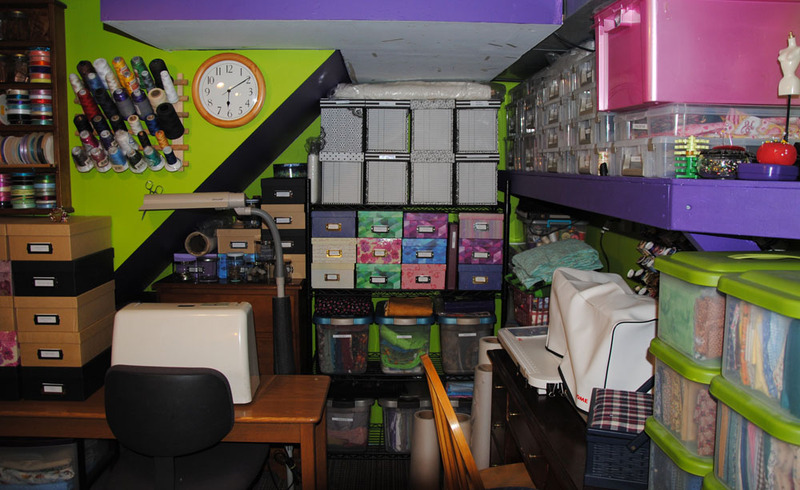 Making a transition to the cellar has proven to provide more working, functional space. 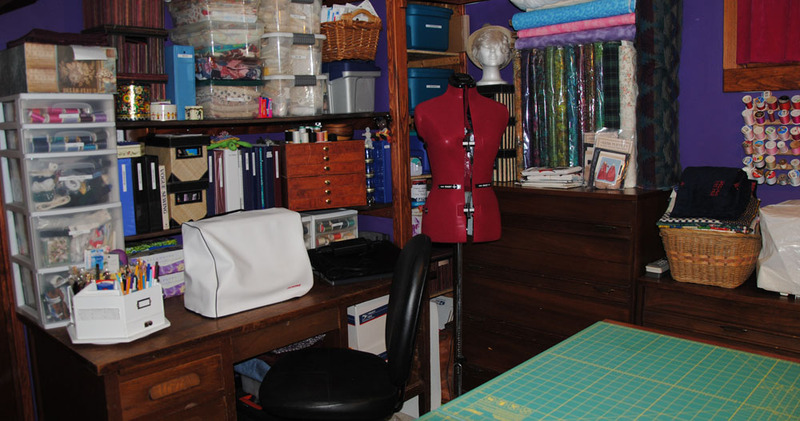 Looking into the sewing room as I scan my space. 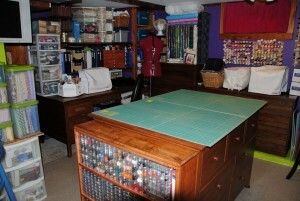 Two matching dressers back-to-back provide a great cutting/working space. 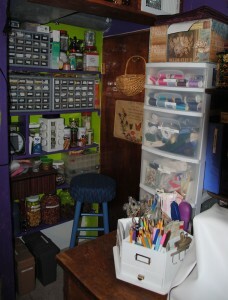 The cabinet in front is the three shelf cabinet my husband made last year for me to store various buttons and supplies. It amazes me how one adapts to their environment, regardless of where they live. I am not typically a person who likes to rearrange furniture frequently, as it is tiring, more so as I get older. Yet, as our youngest daughter shared with us that she planned on spending the summer in ME and planned to find employment there as well when she completed her 2016 senior year, we informed her that we were going to make some changes. 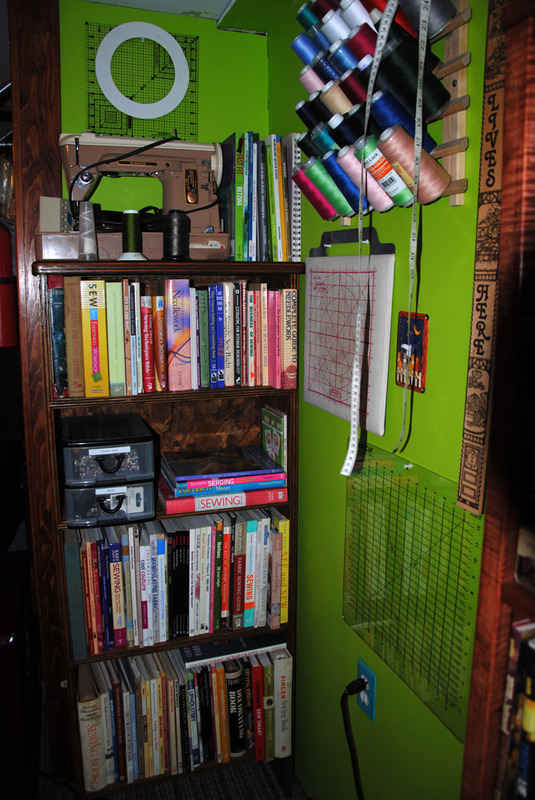 As you turn the corner from the stairs into the room, you are faced with a bookshelf of resources, my mother’s old Singer sewing machine, etc. Since she was rarely home, it seemed rather unfortunate that her large space remained unoccupied from human warmth. The dust was accumulating…basically it was time for momma to take action, or take over this space that was “waiting for the return” of our daughter. I really wanted to paint the room, but due to energy levels, I simply was not able to tackle that at this time. My hope is that I will be able to put carpeting and change this bold color statement that I allowed her to have when she was younger. Yes, you read that right, I allowed her to paint her room any color she wanted. 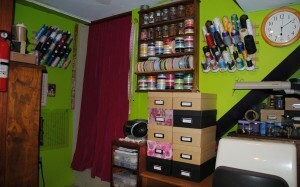 So, now I have a sewing room with bright green and deep purple. Can you get excited with me? Hmmm…I’m not quite sure how long I will be able to handle it, but for now, I will have to adapt. 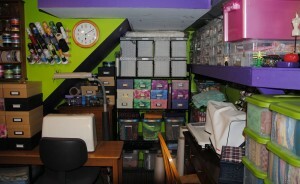 Facing the storage area under the stairwell, I have my regular machine on the left. To the right, facing the other wall, is my heavy duty straight stitch. Fortunately, it was not a matter of buying anything new, but rather transporting downstairs what was in a smaller room on the main floor. 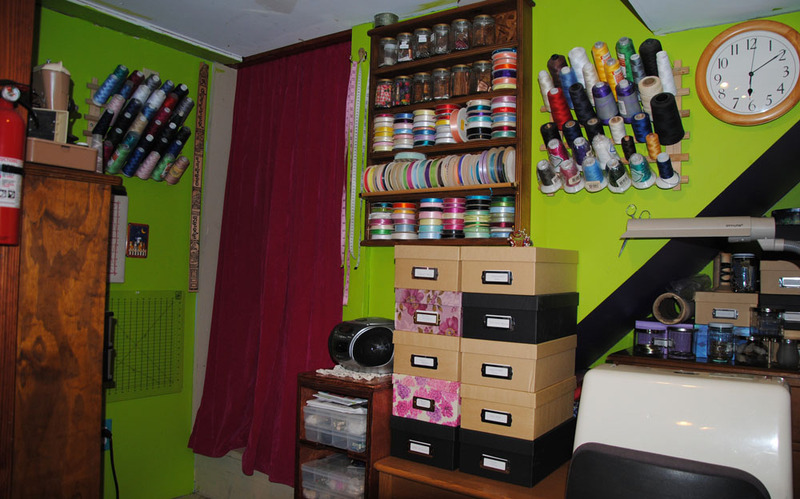 What you will see is that in making a working area functional, is my ability to organize ribbon & trims by type, patterns, fabric by project, etc. Facing the wall with project boxes above, and fabric stash sorted plus patterns to the right of my heavy duty straight stitch Janome. Opening up my space will be quite beneficial in my ability to use up what was given to me, as well as what I specifically purchased for quilts for family members, etc. Why were these items not already made? 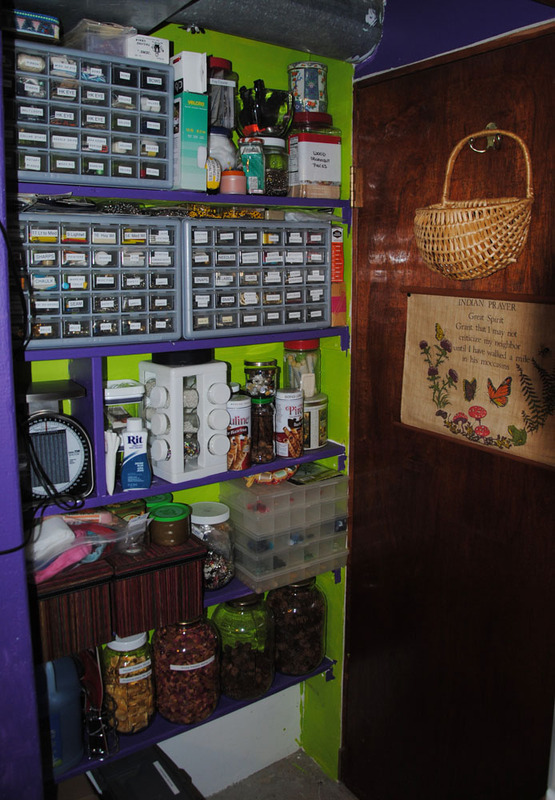 Well, we all have good intentions, yet when I was sewing full time my projects were put on hold (which was heart breaking for me) and then over the last few years I had some health issues that slowed me down quite a bit. I’m slowly regaining my energy, but it is a daily struggle, which is why I took up crochet. For those who have or know someone with Chronic Lyme Disease, you can understand the exhaustion that I have been dealing with. On the tough days I can still feel creatively productive with the work I’ve done with yarn. In our attempt to have a spare room upstairs, we spent over a month (mostly weekends) transferring furniture, cleaning and tossing out stuff, etc. 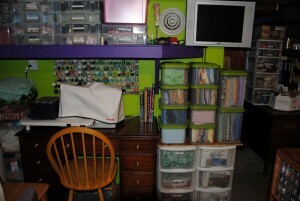 Today, finally, the sewing room is now organized. Although some will love the colors, and others will see how my items “sort of” cover the colors up, I still hope to feel well enough to repaint this room. 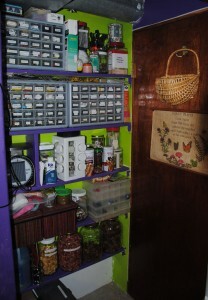 Until then, it is organized so that I can now work on those projects of love as my energy allows. A step back showing the corner as well as the large desk area where my embroidery machine resides. One thing I have learned through life, the more organized one is, the more productive they can be. 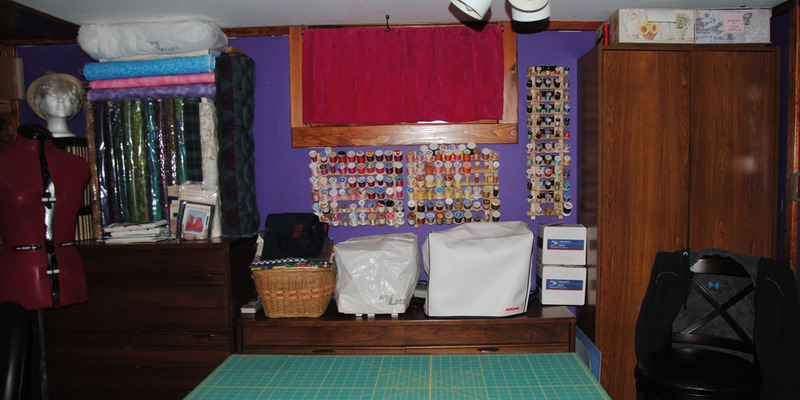 That means I no longer purchase fabric on a whim without an exact project in mind, and one in which I am working on. This means no more stash building. Don’t get me wrong, I occasionally need fabric therapy, so I might visit a fabric shop (fortunately my favorite ones are not too close to home 🙂 ) But, before I go, I take a tour of what I have, just to remind myself that I have plenty as well as what themes I will working with. 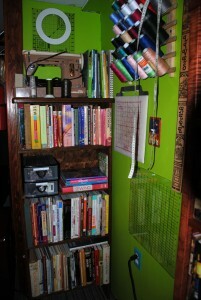 The embroidery and bolt corner. 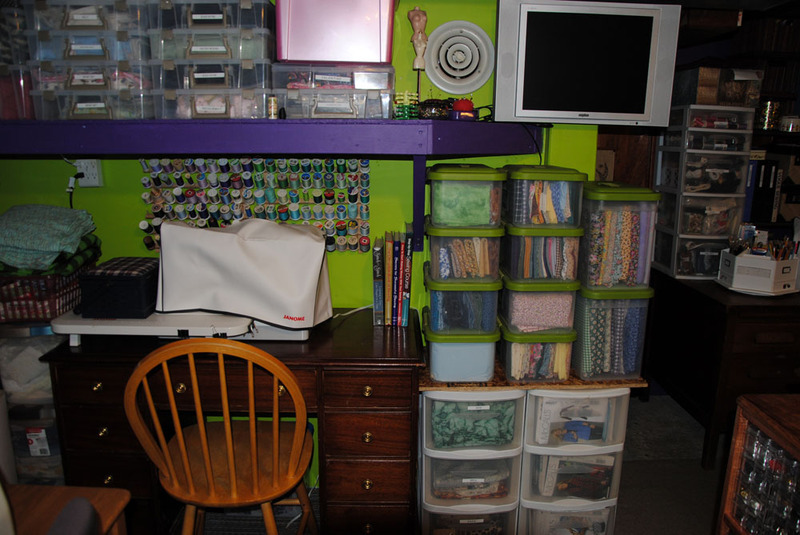 Anyway, the purpose of this post is to share my new sewing area. And, despite the colors, I LOVE it!!! 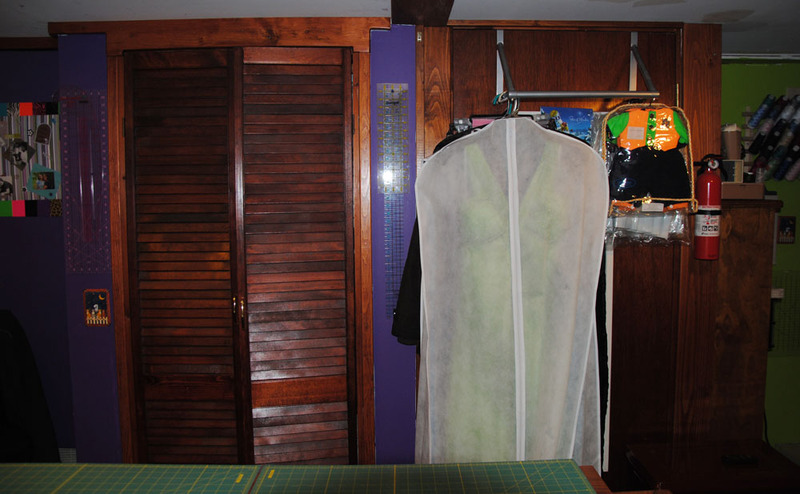 Facing the closets, which will be used for storage, once our daughter has had a chance to go through and determine what she will take to the cold ME weather, and what we will donate or consign. Thank you for visiting and I hope your inspiration keeps your sewing machine(s) humming. 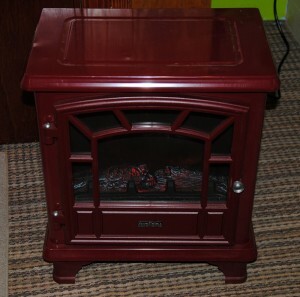 Well, one must keep the home fires burning…lol… Here is my portable heater for the cooler days of winter. 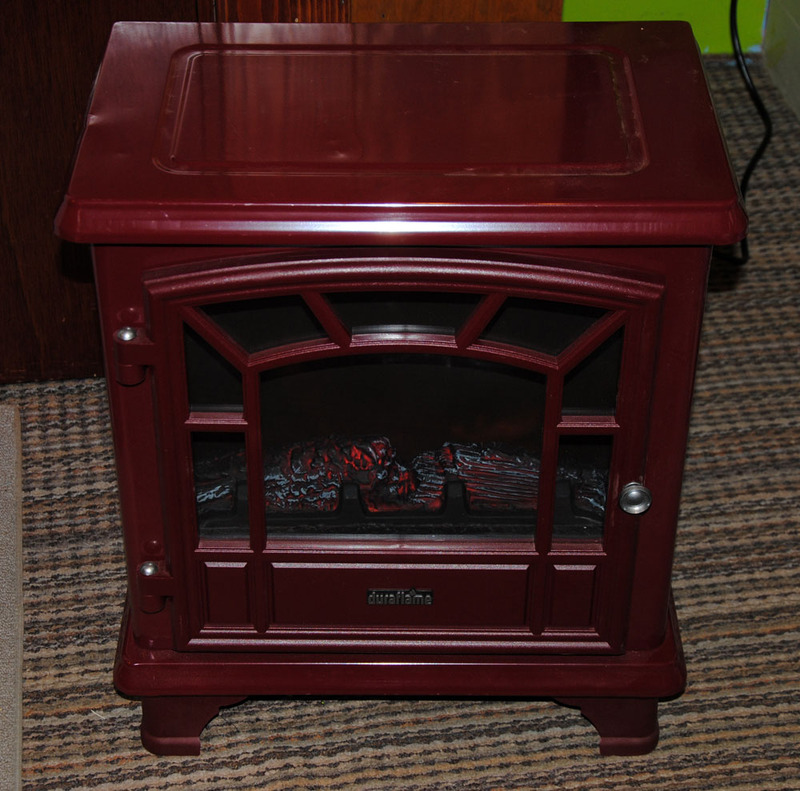 I need comfort in order to work, and this small heater warms the room up quick and nice so that it does not have to remain on for very long.